The living legend of French-American cooking looks back on his most iconic creations so far, from truffle-laced Maine scallops to the gourmet burger that launched a thousand imitators. The New York food scene is notoriously fickle, chewing up hot-shot chefs and buzzy restaurants so fast that it’s a wonder anyone has the gumption to play the game at all. Yet through all the seismic shifts in tastes, one factor remains constant: Up at the top of the heap, you’ll find a small group of insanely talented French dudes clinking glasses of first-growth Bordeaux and surveying their kingdoms. Along with Jean-George Vongerichten and Eric Ripert, Daniel Boulud is one of the true titans of that O.G. crew, having been a fixture of the city’s fine-dining scene for nearly three decades. Beginning at the legendary Le Cirque, where he won a James Beard Award for Best Chef of New York City in 1993, the Lyon-born chef opened his Upper East Side flagship, Restaurant Daniel, in 1998 and has since built a French-American empire that stretches from Miami to Singapore. Like Jay Z, Boulud has managed to go global without losing the swagger—or NYC fan base—that made him a star in the first place. His high-end restaurants remain bastions of haute-French cooking, anchored by a world-class charcuterie program and a deep reverence for classic Old World recipes (many of which are cataloged in stunning detail in the chef’s most recent book with Bill Buford, My French Cuisine). Every chef is remembered for a few dishes, even if he creates thousands of them. But, perhaps most impressively, Boulud has proved adept at staying perpetually relevant. His notorious DB Burger—a French take on the American classic, packed with red wine-braised short rib and foie gras—effectively launched the trend for gourmet patties, and his reputation as a Gallic party machine has made him a dependable fixture in food-blog culture (on any given night, you might find him snapping selfies with Sammy Hagar, or cooking a surprise dinner for Wylie Dufresne while tied to Danny Bowien). With DB Brasserie, a brand-new Vegas outpost, opening on April 24 inside the Venetian, Boulud shows no signs that he’ll be pumping the breaks anytime soon. But after more than 20 years and innumerable accolades at Restaurant Daniel, it seemed like a good time to convince DB to sit down and take a look back at his story so far. “Every chef is remembered for a few dishes, even if he creates thousands of them,” he says. Here, the powerhouse chef takes us through some of the creations that he believes will define his own legacy when he finally decides to hang up his whites. When I started at Le Cirque in 1986, it was a house of tradition. It was French by the chef who was there before me, but it was Italian by Sirio [Maccioni], who was the man of the house. They always had passion for classic dishes, so they were making pot au feu French-style, and [Italian] bollito misto to keep Sirio happy. I always felt their bollito misto was very good, but their pot au feu was very average—it was not pretty or glamorous, just boiled meat. So I told Sirio I’d make him a Pot Au Feu "Royale" where I had a whole poached foie gras, cured duck, truffled chicken, and beef shank; there was also veal shank, sweetbread, and short rib, and a beef tenderloin cooked rare in a very concentrated broth, with beautiful vegetables. It cost a fortune, and I always made a big display of presenting it to the guest. That’s where I found my excitement cooking at Le Cirque. I was creating dishes that were unique to my time there, but also taking classic ideas and making them better. When I started at Le Cirque, I wanted to find some new dishes, and this one went through a bit of an evolution. It started without the crust—just layers of scallop and truffles, cooked gently and served with a little bit of spinach in a truffle beurre blanc. It was a very pure and simple appetizer. But then, for New Year’s Eve in '87, I upped the game a little bit. Instead of putting spinach on the plate with the simple layered scallops and truffle, I put the spinach around the scallops after it was sliced and layered it with the truffle, and then I put that into a very thin crust of puff pastry. In terms of technique, that dish was amazing because it was a question of cooking the puff pastry just enough to warm up the scallops inside and get a beautiful crust on the outside. And so this recipe, in its second version, became an instant classic, and we never changed it after that. Every year at Daniel, for New Year’s Eve, we make the Black Tie—[the name refers to the fact that] everyone comes in a black tie, and the dish is black and white. We started to do the baby madeleine here at Daniel as a petits four in the early '90s. I was trying to find a petit four that was convenient to produce with [pastry chef] François Payard—something traditional, but something no other restaurant was doing. Many restaurants do madeleine now, but we have doing that for maybe 18 years, and it has become a signature. Sometimes, it’s not about [making things] complex and manicured, time-consuming and expensive. It’s about how people feel about it. The simplest thing is the thing people remember the most. The madeleine is one of the things people crave— it doesn’t matter how young or old you are. At Daniel, we often have people asking for extras to take home for their kids. So, universally, this is one of those cookies that just makes everyone happy. I didn’t want to create a burger to make a burger chain. I wanted to make a gourmet burger, and the story started with a journalist from the New York Times who was writing a piece on José Bové, the French activist who burned down the McDonald's in Toulouse. When the journalist came to Daniel to interview me, I didn’t have much to say, but I had it in my mind to create a burger—a fun burger, something more French. After this conversation with the reporter, I said, ‘Okay, maybe this is my opportunity to make it’—I really wanted to make a burger that would be worth talking about. We didn’t try to make a gimmick out it, but many other people started to make a gimmick out of the gourmet burger. I made the first DB Burger exactly like [the one we serve now], invited the reporter back, and served it to him and about four or five tables of regular customers who eat with us all the time. People went [crazy]. They loved it from the minute we made it, but it didn’t have a place to be. And so a year later, I opened DB Bistro [Moderne] and that’s where we placed the DB Burger. Six months after that, Old Homestead saw the publicity and they put out a Wagyu burger, or something really expensive. They were just trying to beat the price, because Guinness had recorded our burger as the most expensive burger in the world. During fresh black-truffle season, and the burger can go up to $150 [the "Super Royale" has four layers of truffles], but the price always had good logic behind it. The first burger was around $28, and then it went up to $32 because the meat kept creeping up. It has been at DB for around 12 years, and the increase is nothing compared to the cost of living. We didn’t try to make a gimmick out it, but many other people started to make a gimmick out of the gourmet burger. We serve the burger in Singapore as well, and the different DB Bistros. That’s a dish that kind of marked its time and showed my interest in things other than old cuisine. Often, when I think of a chef, I think of some of the dishes that have been with him for quite a long time and become classics. For example, if I'm thinking of Thomas Keller, I'm thinking of the Oysters and Pearls or the cornets of salmon; Thomas made some of the most amazing dishes, but to me Oyster and Pearls was almost poetic, in a way. In France, there's Alain Senderens—for him, it's his Canard Apicius. For Michel Guérard, it was the salade gourmande. Paul Bocuse, of course, was the loup en croute—he has a number of classic dishes. You think about David Chang and, right away, you think about the pork buns. You could have had pork buns before, but once you had David Chang's pork buns, you don't want to go back anywhere else. And that's like the DB Burger, as well. It becomes iconic for a chef. 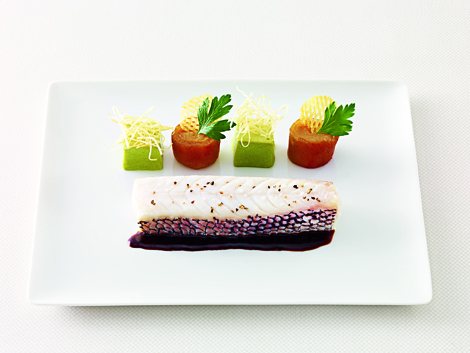 For me, the paupiette of sea bass is one of those dishes. [The origins of the dish] go back to 1985, when I decided to leave the [Hotel] Plaza Athenée to go and work at Le Cirque. I went to Europe for a couple of months before starting in September of 1986. I went to visit Paul Bocuse in Lyon, and I spent some time in his restaurant. Also, my wife was from Switzerland, so I often went to Girardet in Crissier. At the time, Frédy Girardet was making a red mullet with little tiny scales of zucchini on it—[he was] recreating the scale of the fish with zucchini. I found that very beautiful. And then I went to Paul Bocuse, and he was also doing a red mullet, but with scales of potatoes. What's interesting with a dish that becomes a classic is how simple the recipe can be. That was around the time when we started to get Japanese mandolins [in the kitchen], where you could cut things very thin and even. So I started playing with the mandolin to cut very large Idaho potatoes, which I could lay down next to each other and put a filet of sea bass inside. By the time I cooked the potatoes, the sea bass was perfectly cooked. I knew I had a winner right then—I never changed the recipe after that. What's interesting with a dish that becomes a classic is how simple the recipe can be. This one has only four ingredients: You start with a sea bass, or a striped bass; then, it's about potato, it's about leeks, and it's about red wine—a red-wine sauce, like a beurre rouge. Those four ingredients made that dish sort of an iconic dish for me, but also for Le Cirque, which still serves the paupiette of sea bass today. About six years ago , when we redid Daniel completely, I had an argument in the kitchen with my chefs. They said, "Chef, we don't want to cook the sea bass anymore—we've cooked it enough, you should take it off the menu." I was not very happy, but I told them, "Okay, if we're going to take the sea bass off the menu, we're going to keep the elements that made that dish: the sea bass, the potato, the leeks, and the red wine." And we still carry to this day new interpretations of this combination of four ingredients. Gavin Kaysen, the chef at Cafe Boulud, felt terrible for me, so he said, "What would you think, Chef, if I cooked the paupiette of sea bass at Cafe Boulud?" I said, "Whatever you want to do, Gavin—I would love it!" So Gavin brought back the sea bass at Cafe Boulud a couple of years ago, and now we maintain it as a classic there. The aioli, for me, [is all about] being in the Mediterranean, but mostly about being in Provence. It's about going to the market, picking up anything fresh and good, and making this beautiful platter of cooked and raw vegetables and serving a dip, so you can have a four-hour lunch—just cooking and eating, drinking rosé, and feeling very laid-back. Maybe 15 years ago, I went to [Bernardaud China CEO] Michel Bernardaud’s home on the coast of France, and his wife served us [an aioli]—we had some potatoes, some radishes, and some poached local fish. It was such a wonderful moment, and everything was in the dressing. Aioli is all about the dressing. After that, I started thinking that we don’t do enough aioli, so when I opened Bar Boulud, we introduced [this dish]. I do it at home with friends and things like that, but at Bar Boulud we tried to be careful with the garlic—we do it half cooked garlic, half raw, but normally you go straight raw; you just have to not be afraid. It’s perfect on the weekend when you can digest all that garlic. Since I opened [the original] Daniel on 76th Street 20 years ago, I've had this dish we created with celery, green apple, and crab. We’ve done many different interpretations; the one [in this photo] is maybe one of the mid-period versions—I recognize the plate, which was from the first Daniel on 76th Street, somewhere in the 2000s. Sometimes there’s some celery root, and there’s different apples in early fall and late fall…it’s a dish that keeps changing faces, but remains the same body. I’ve always practiced a very market-driven, seasonally driven [style of cooking], but it's not something based on a full set of rules. I like the tartness of the apples, and the crisp and fresh taste of celery. At one point, I was doing a celery remoulade with it, to give it a little bit of richness with the crab. And the crab is often seasoned with a light mayo with some tarragon inside—there’s always some tarragon somewhere, combining a little bit of anise flavor to that veggie, fruity flavor. In the new cookbook, there’s a new rendition where we turn the apple on a Japanese mandoline and make an apple roll with the crab inside. The original version was a molded salad. This terrine represents my passion and love for charcuterie. The way we make it is very elaborate and fancy—it’s with guinea hen, foie gras, pickled porcini mushrooms, and layers of different meats inside with a little bit of the liver of the guinea hen. At Daniel, we serve it in the most sophisticated and simple way; we don’t give you a big slab or slice of pâté. But at Bar Boulud, it’s part of an array of charcuterie where you have many different kinds of terrine. The DNA of charcuterie has been with me forever. I always made a lot of charcuterie everywhere I cooked around the world, but it was always more creative than just being a charcutier. When we teamed up with [renowned Parisian charcutier] Gilles Verot and decided to create Bar Boulud around charcuterie, I wanted to make sure our program was beyond my knowledge about what I like about charcuterie—I wanted to have a little bit of rusticity to it, and a little bit more authenticity. [The point was] really not to be as creative, but to be French and Lyonnaise. When we created Bar Boulud, it was about pâté, terrine, and certain [traditional] sausages like boudin blanc and Morteau. But for DBGB, my dream was to go around the world and create sausages that each represented another country or region of France. Gilles Verot had never really developed many sausages other than the classics he knew, so we worked together on creating the Thai sausage, a wonderful Merguez, and so on—we wanted to take classic techniques and tweak them the way we like. For me, the Beaujolais is where it all started, since [it traces back to] Lyon, my hometown. That sausage is all about red wine, and the simple garniture of onion, mushroom and bacon inside. It has a little bit of smokiness from the bacon, and the mushroom and the pork belly are marinated with red wine. [It reflects] the love of very humble and affordable food—the lentils [served beneath the sausage] are the "caviar of the poor." This is meant to be a dish for people who don’t like it fancy. This is not extra fancy; it’s extra easy. This is the latest classic, which we made with [pastry chef] Ghaya Oliveira at Bould Sud. The year before we opened, I took a trip to Turkey and I was eating all this crazy stuff: loukoum, rosewater, halva…a lot of things with sesame. Ghaya is Tunisian, so this was a little voyage toward the Eastern Mediterranean where she grew up. The beginning of the idea was the lokum and the sesame. Then we added the citrus, and that’s how the dish developed a little bit more and eventually became the givré.